Born in Buffalo, New York in 1939 he was educated in that city’s school system. His father died suddenly driving his taxicab when Lance was in eighth grade. A pet lover as a boy, he considered veterinary medicine. One summer during high school, coordinated by Cornell University’s Veterinary School, he worked on a dairy farm. This experience further broadened his perspective of life ─ but he realized that working with large animals was not for him. Upon returning to Buffalo, he took an after-school job operating the cigarette-smoking machine at a major cancer research facility. It was pre-medicine from then on. Lance attended the State University of New York at Buffalo, majoring in Anthropology and Linguistics…“The best major I could have had. 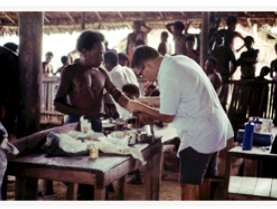 It helped me appreciate that we’re all the same in this world; we must recognize that our individual cultures and beliefs all have value.” It was this background that stimulated his work with a Australian physician at an Anglican Mission Hospital in Papua New Guinea during a summer between medical school semesters in Buffalo in 1964. This tropical medicine adventure of two and one-half months was followed by traveling home via circumnavigating the globe for another six weeks, visiting many major cities in Australia, Asia, and Europe. During service in the U. S. Public Health Service as a Tuberculosis Control Officer for two years, he earned a Master of Public Health Degree while stationed in Oklahoma. This was followed by neurology training in Cleveland, Ohio. As a board certified neurologist, he practiced general clinical neurology full-time at a Kaiser Permanente Medical Center in Southern California, retiring in 1997 with part-time practice until recently. He currently teaches medical students and resident physicians as Clinical Professor of Neurology at the UCLA School of Medicine. He established the Edward Fogan Annual Neurology Lecture/Prize in honor of his father in 1986 at the Neurology Department in Buffalo’s medical school; two Nobel Prize winners are among the speakers, to date. What enriches his life is his marriage of 45 years, his two daughters, and being grandfather to two young grandsons. 2009: Fogan, L. William Shakespeare: Renaissance Physician. In: Creativity & Madness; Psychological Studies of Art and Artists. Vol.2, Chapter VIII, pg 118-146. Barry M. Panter, Editor, Los Angeles, CA. Aimed Press. 1995: Fogan, L. Sea Bass with Mexicana-Chinoise Sauce. Bon Appetit Magazine. September 1995: 145-6. 1990: Fogan, L. John Cheyne. Aswal, S., ed. The Founders of Child Neurology. San Francisco: Norman Publishing, Pg 107. 1990: Fogan, L. The Neurologist of Avon. New Scientist. London, No. 1700: 43-45, January 20. 1989: Fogan, L. The Neurology in Shakespeare. Arch. Neurol. 46: 922-924. 1989: Fogan, L. Managing Cluster Headache. Medical Aspects of Human Sexuality. Vol. 23, No. 3, pg. 42. 1985: About Dr. Fogan's research: Oxygenated aid for cluster headaches in VOGUE. Pg. 151, Dec 1985. 1985: Fogan, L. Oxygen Therapy in Cluster Headache: A Double Blind Study with Air. Arch. Neurol. 42: 362-362. 1974: Fogan, L. and Munsat, T. Spinocerebellar Degenerative Diseases, Chapter 3, pg. 38-62 in Spinal Deformity in Neurological and Muscular Disorders, Publisher C. V. Mosby Co., St. Louis, MO. 1970: Fogan, L. Atypical Mycobacteria, Their Clinical, Laboratory, and Epidemiologic Significance. Medicine (Baltimore), 49:243-255. 1969: Fogan, L. PPD Antigens and the Diagnosis of Mycobacterial Disease. Arch.Int. Med. 124: 49-54. 1968: Fogan, L. and Burke, R. M. Review of Patients Readmitted to Oklahoma State Tuberculosis Sanatoria. Journal Okla. State Med. Assoc., May, 212-216. 1987: Fogan, L. The Brain Code, by Norman Cook. New Scientist, London, No. 1550: pg 56-57, March 5. 1986: Fogan, L. The Way We Die, by Leslie Ivan and Maureen Melrose. New Scientist, London, No. 1527: pg. 59, September 25. 1986: Fogan, L. The Fabric of the Mind, by Richard Bergland. New Scientist, London, No. 1523: pg 48, August 28. 2013: Mini-Workshop: Epilepsy: Recognizing Covert, Non-convulsive Seizure/blank outs in the School Environment. Presented at the California Association of School Psychologists Convention, Hyatt Regency Hotel, Newport Beach, CA. November 7. 2004: Guest Lecture: The Neurology in Shakespeare. Presented at the Creativity & Madness: Psychological Studies of Art and Artists Conference. Santa Fe, N.M. February 15. 2001; 1995; 1994; 1993: Course Instructor: "William Shakespeare - Renaissance Physician". Chautauqua Institution, Chautauqua, N.Y. 14722. 1989: Guest Lecture: The Neurology in Shakespeare. Presented at the Institute of Neurology, The National Hospital, Queen Square, London, England. June 13. 1988: The Neurology in Shakespeare- Presentation at the Old Globe Theatre, San Diego, CA, August 8 (Fund Raising Event Supporting the Likuni Catholic Mission Hospital, Malawi, Africa, Dr. Herb Sorenson, Director). 1980: The Occult Hydrocephalus Syndrome Secondary to Cerebral Cysticercosis. Presented under the auspices of the Sino – American Neurology Tour Professional Seminar Consultants, Inc. of Oceanside, N. Y., 11572, in Shanghai, Peoples’ Republic of China, July. 1973: The Occult Hydrocephalus Syndrome Secondary to Cerebral Cysticercosis. Presented to the Tenth World Neurology Congress, Barcelona, Spain. September. 1989: The Neurology in Shakespeare - The Health Show. KABC Television, Los Angeles, CA. April 23. 1988: The Neurology in Shakespeare - KGTV (San Diego ABC affiliate: Channel 10) interview with Laura Buxton. August 8. 1985: Cluster Headache Interview – KCBS TV Health Reporter Steve Gendel. Oct. 14. 1985: Cluster Headache Interview – National Public Radio – Science Reporter, Laurie Garret. July 2. 1985: Cluster Headache Interview – KNBC TV Health Reporter Carol Hutchinson. April 4. 1983: Epilepsy – Alive and Well Program – Cable Television. Interview with Joanna Carson. May 11.